It might not be Halloween just yet, but a collector has commissioned Jon-Paul Kaiser to take on FUNKO x Garbage Pail Kids vinyl figure and what an outcome. 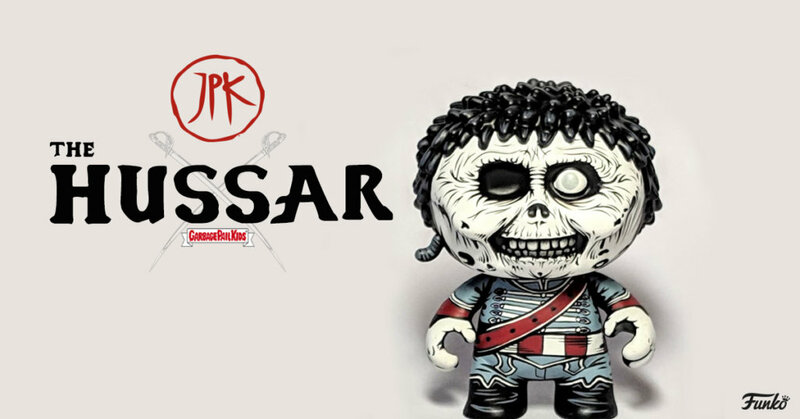 Meet The Hussar by JPK adding his signature style to Garbage Pail Kids mini-series. Let’s not take anything away from FUNKO x Garbage Pail Kids original sculpt as that was good in in-self but JPK shows what potential can be done when given the silhouette to work on. JPK gives one character a different look. JPK gave it the Hussar light cavalry, originating in Central Europe during the 15th and 16th centuries look. Hussar was a commissioned custom, so not available to purchase. But you can always drop JPK a message on his Instagram HERE or Facebook HERE. Knock knock Funko time to give some artists some productions. Find JPK on Instagram and Facebook.